Geografi: Russisk: Alaxsxaq / Det objekt [halvø], mod hvilket havets bevægelse er rettet. 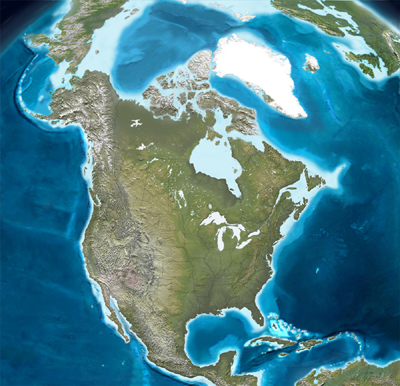 Amerikansk delstat med grænse til Canada og med kystlinjer til Det arktiske hav, Bering-strædet og Stillehavet. Assessment of Cultural Heritage Monuments and Sites in the Arctic. / : Arctic Council's Sustainable Development Working Group, 2013. Den amerikanske regering købte Alaska af Rusland i 1867, og området optages som USA's delstat nummer 49 den 3. januar 1959. Tre underjordiske atomvåbenforsøg, ved Amchitka øen, 1965-1971. Oplysninger om forsøgene er stadig skjulte eller maskerede som klassificeret information, men Greeepeace konkluderer, at 'Cannikin atomprøvesprængningstedet på Amchitka, området for den største underjordiske atom-prøvesprængning i amerikansk historie er utæt. 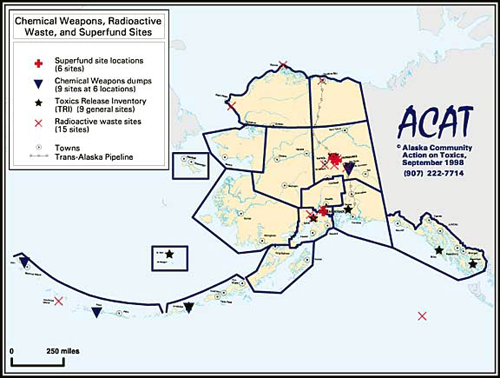 Elementer af radioaktivitet siver ud i Beringshavet via White Alice Creek / 'The Cannikin nuclear test site on Amchitka, the site of the largest underground nuclear test in U.S. history is leaking long-lived transuranic radioactivity into the Bering Sea via White Alice Creek. Two biological samples taken by Greenpeace researchers from White Alice Creek downgradient from Cannikin revealed the presence of americium-241, a beta decay product of plutonium-241. Americium-241 in the environmental samples indicates the presence of plutonium isotopes in the groundwater-surface water system at Amchitka. One of the two stream samples contained plutonium-239/-240. The plutonium-239 used to trigger the Cannikin fusion explosion (possibly 9-11 pounds of plutonium-239 2) was co-produced with plutonium-240 and plutonium-241 in a nuclear reactor designed to create weaponsgrade plutonium'. Elmendorf Air Force Base herunder Alaskan Command (ALCOM), Alaskan NORAD Region (ANR), Eleventh Air Force (11th AF) og the 3rd Wing. Fort Richardson Homes, National Guard og Joint Base Elmendorf-Richardson. VIDEO 6/5: What is Israel doing in Alaska?! (By: The Peace Report) Israel will be testing their Arrow 3 weapons system, among other things, on Kodiak Island, Alaska in the summer of 2018. The Arrow 3 weapons system was funded and developed by both Israel and the United States. All amenities and resources will be provided for the Israeli military free of charge, paid for by American taxpayers. 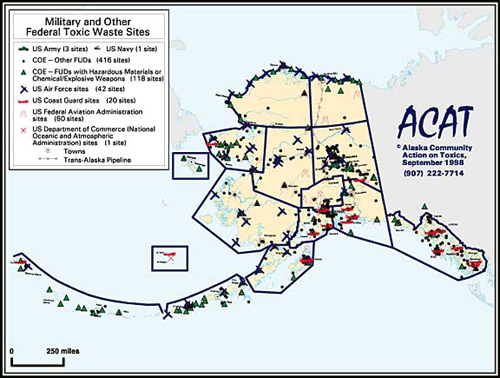 Kodiak has a long history of pollution from the Pentagon that they are still trying to clean up from WW2. Se også: Distant Early Warning Line ; US High Frequency Active Auroral Research Program ; Ground-Based Midcourse Defense, Alaska ; Operation Windstorm. Lost Heritage of Alaska: The Adventure and Art of the Alaskan Coastal Indians. Polly Miller and Leon Gordon Miller. Introduction Ernest Gruening. - Cleveland and New York: The World Publishing Company, 1967. 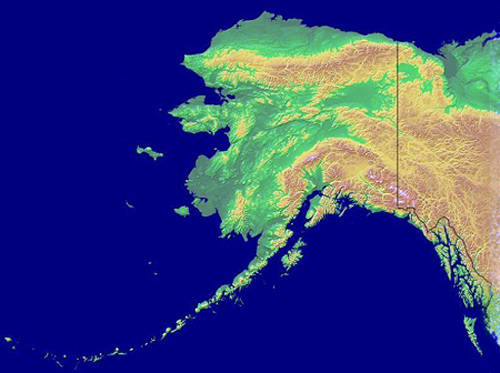 Religion: The Russian Orthodox Church of Alaska and the Aleutian Islands and its relation to Native American traditions : an attempt at a multicultural society, 1794-1912. / : Vyacheslav Ivanov; Washington : Library of Congress, 1997. - 66 s. ; Includes bibliographical references (p. 48-59). Alabama ; Arizona ; Arkansas ; Californien ; Colorado ; Connecticut ; Delaware ; Florida ; Georgia ; Hawaii ; Idaho ; Illinois ; Indiana ; Iowa ; Kansas ; Kentucky ; Louisiana ; Maine ; Maryland ; Massachusetts ; Michigan ; Minnesota ; Mississippi ; Missouri ; Montana ; Nebraska ; Nevada ; New Hampshire ; New Jersey ; New Mexico ; New York ; North Carolina ; North Dakota ; Ohio ; Oklahoma ; Oregon ; Pennsylvania ; Rhode Island ; South Carolina ; South Dakota ; Tennessee ; Texas ; Utah ; Vermont ; Virginia ; Washington ; West Virginia ; Wisconsin ; Wyoming. Consortium for Risk Evaluation with Stakeholder Participation II:Background on Amchitka, 2005. - 18 s.
Formerly used Defense Sites in the Norton Sound Region: Location, History of Use, Contaminants Present, And Status of Clean-Up Efforts. Prepared for Alaska Community Action on Toxics / Mimi Hogan, Sandra Christopherson and Ann Rothe. 2006. - 47 s.
Miller, Pam: Nuclear Flashback: Report of a Greenpeace Scientific Expedition to Amchitka Island, Alaska – Site of the Largest Underground Nuclear Test in U.S. History. Greenpeace, 1996 - 33 s.
Nevada Environmental Restoration Project: Subsurface Completion Report for Amchitka Underground Nuclear Test Sites: Long Shot, Milrow, and Cannikin, 2006. - 63 s.